I Need Your Love – Is That True? 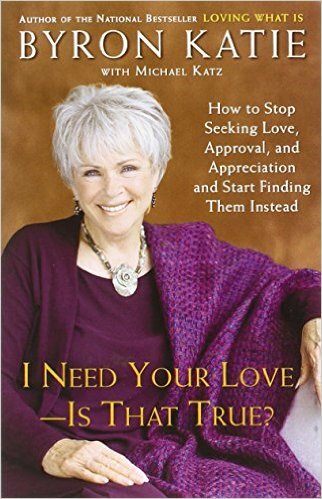 In Loving What Is, bestselling author Byron Katie introduced thousands of people to her simple and profound method of finding happiness through questioning the mind. Now, I Need Your Love—Is That True?examines a universal, age-old source of anxiety: our relationships with others. In this groundbreaking book, Katie helps you question everything you have been taught to do to gain love and approval. In doing this, you discover how to find genuine love and connection. The usual advice offered in self-help books and reinforced by our culture advocates a stressful, all-consuming quest for love and approval. We are advised to learn self-marketing and manipulative skills—how to attract, impress, seduce, and often pretend to be something we aren’t. This approach doesn’t work. It leaves millions of walking wounded—those who, having failed to find love or appreciation, blame themselves and conclude that they are unworthy of love. I Need Your Love—Is That True? helps you illuminate every area in your life where you seem to lack what you long for most—the love of your spouse, the respect of your child, a lover’s tenderness, or the esteem of your boss. Through its penetrating inquiry, you will quickly discover the falseness of the accepted ways of seeking love and approval, and also of the mythology that equates love with need. Using the method in this book, you will inquire into painful beliefs that you’ve based your whole life on—and be delighted to see them evaporate. Katie shows you how unraveling the knots in the search for love, approval, and appreciation brings real love and puts you in charge of your own happiness. “Everyone agrees that love is wonderful, except when it’s terrible. People spend their whole lives tantalized by love—seeking it, trying to hold on to it, or trying to get over it. Not far behind love, as major preoccupations, come approval and appreciation. From childhood on, most people spend much of their energy in a relentless pursuit of these things, trying out different methods to be noticed, to please, to impress, and to win other people’s love, thinking that’s just the way life is. This effort can become so constant and unquestioned that we barely notice it anymore.